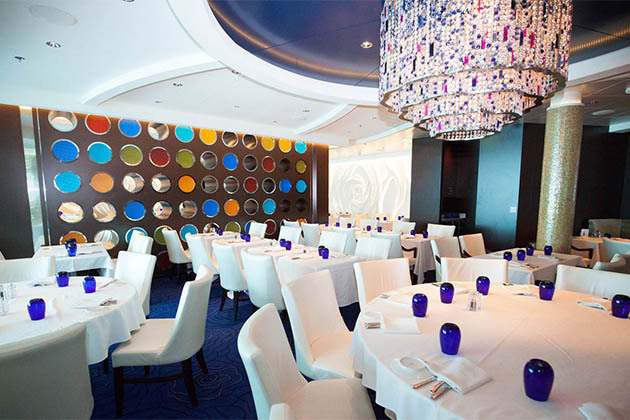 Celebrity Cruises has been gradually moving toward more exclusive offerings for its higher-paying passengers, and Blu and Luminae -- both specialty restaurants for select passengers only -- are two examples of this. Blu caters to those in AquaClass cabins, offering an elegant take on spa cuisine that derives inspiration from California and the Mediterranean. 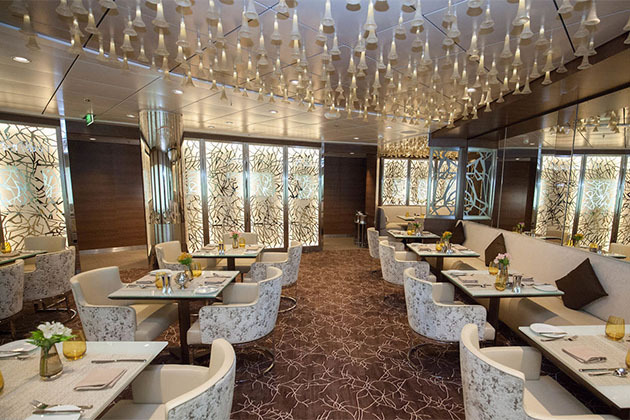 Luminae, a refined full-service restaurant shimmering in black, gold and cream, is open to suite passengers only. 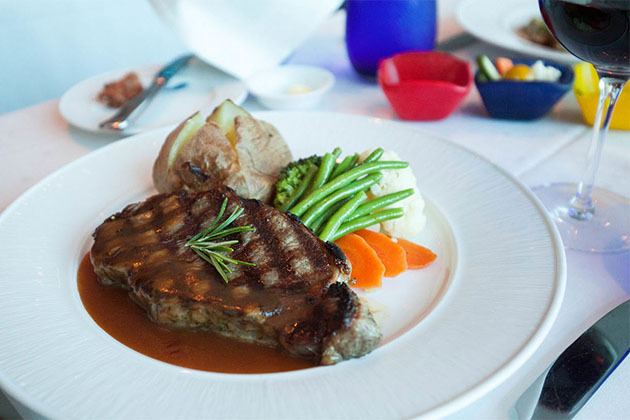 Both restaurants offer superb service in an intimate atmosphere, but it's important to note that while suite passengers are able to arrange meals in Blu, AquaClass passengers do not have access to Luminae. To help you decide between the perks of Celebrity Luminae versus Celebrity Blu (and, by association, which cabin class to choose), we've made them easier for you to compare. In a word, the ambiance at Luminae is "rarified." Its opulence is emphasized through its decor: rich golds and blacks with lots of mirrors and lights, befitting its name. 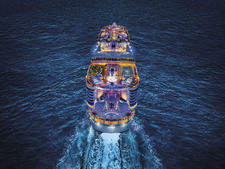 The 92-seat restaurant is only available to suite passengers. All tables are first-come, first-served (unless you make a reservation in advance for a specific table or to accommodate a large party). Suite passengers are able to dine outside of Luminae, in the main dining room or elsewhere; they can also invite friends in other cabin categories to dine within Luminae for a fee. 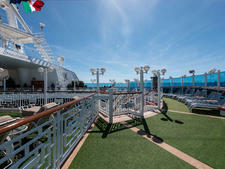 Luminae's menu is small, international and changes daily, depending on the ship's location and time of the year. Dinner begins with an amuse-bouche, like caviar. Evening appetizers might include Maine Lobster salad, beef tartare, Jerusalem artichoke soup and roast squab. Entrees might include variations of venison ragout, Alaskan halibut, veal loin and cauliflower steak with curried yogurt. Don't miss the exquisite cote de boeuf. Dessert is the most extravagant part of a meal at Luminae. Tempting treats include a ricotta cheesecake with berries and mint, and chocolate lava cake with vanilla gelato. On chic nights, you'll notice a whimsical little cart wheeling your way. That cart is filled with a Willy Wonka-like assortment of candies, cookies, little cakes and other tempting sweets to fill a separate plate. It's indulgent, but delightfully so. For breakfast, enjoy an eggs Benedict with Scottish smoked salmon, huevos rancheros or an egg white wrap with veggies; crepes, French toast, pancakes and Belgian waffles are also available each day with your choice of fruit. Sides include chicken apple sausage, corn beef hash, oatmeal and buttermilk biscuits in gravy. Continental items, like yogurt, granola, half a grapefruit or a Danish pastry are also on the menu. Lunch at Luminae can be as simple as a burger, or as elaborate as a seafood brochette with a side of lobster bisque. Three appetizers, three sandwiches, three entrees and two desserts make up the menu. Options rotate, but the signature burger with cheddar and bacon-onion jam on a sesame bun is always available (with truffle fries). Like with dinner, afternoon sweets aren't taken lightly -- finish up your midday meal with an olive oil cremeux pudding with strawberry, orange and lavender crumbles or a white chocolate macadamia cake with pralines and pistachio gelato. It's all about eating clean at this eatery, and this extends to the decor, which is rather icy and cool. Where Luminae is black and gold, Blu is blue (of course!) with white. It's effectively a private dining room, so there's a feeling of exclusivity. The white walls and shimmering sapphire-like lighting evokes visions of the Mediterranean. Like the flower sculpture blooming along one full wall, even the butter is shaped into a tiny rose (and roses are the pattern of the carpet as well). On the menu, expect healthy options that include grilled tamarind-glazed quail, chilled seafood Napoleon, grilled salmon filet and roast chicken breast. For those willing to splurge on a bit more calories, you'll also find pan-seared filet mignon and New York strip steak. A standout is the herb-crusted rack of lamb -- braised lamb shoulder in filo pastry with green peas, fingerling potatoes and a pinot noir sauce. 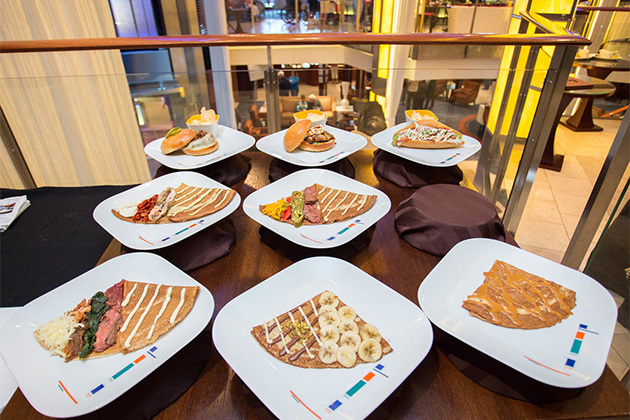 Dessert selections at Blu might include a warm crepe with bananas and blueberries in vanilla sauce or a dulce de leche crema Catalana. 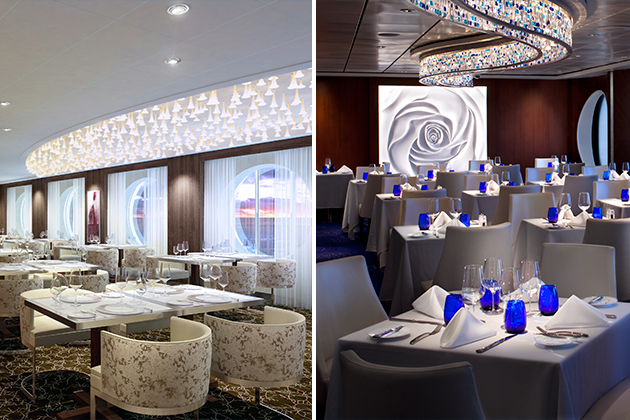 Reservations are not required at Blu for AquaClass passengers, but are recommended for those staying in Suite Class, since they have their own dedicated restaurant. 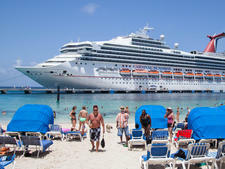 Let the maitre d' know if there is a table preference or a large party to be accommodated at some point in the cruise. 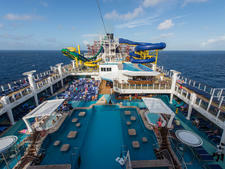 AquaClass passengers can dine outside of Blu, but passengers in any cabin class below that are not permitted to eat at Blu. Blu serves a full breakfast with smoked salmon, customizable omelets (including or excluding the yolks), French toast or pancakes with berries, and breakfast sides like sauteed mushrooms, steamed tofu or a roasted tomato. Plenty of yogurt parfaits, fresh fruit, smoothies and even tableside muesli, are also on hand. Lunch is not served at Blu. Choose Blu for your dining pleasure if you like your food simple and straightforward (not doused in rich sauces). Or, you like to start your morning with a solid smoothie and feel that lunch doesn't need to be a three-course affair. If you prefer your food inspired by the season and itinerary, your menus eclectic and changeable, and eating in a chic atmosphere with like-minded diners, you might be better suited to Luminae.